Oh, that. Yeah, there’s something about a spit-polished BDS blower and belt drive as wide as your street that grabs your attention. But grabbing attention isn’t exactly what our anonymous friend George is all about. The Red Rat hasn’t been around the traps lately. We first profiled this 1980 XD Falcon, looking rather more sedate, way back in 1986. George – who gets around just enough not to need naming – had started with a bare XD shell and built it mild with an LTD nose and tunnel-rammed Cleveland. He did about 1000 clicks in the thing before it disappeared. Anyone asked, George told ’em he’d sold it. Actually, the 28-year-old mechanic had salted it away at his uncle’s place, then in a back room of his Melbourne workshop, outlandish visions forever swimming in his fevered head. Dominating that vision was the most monstrous, trouser-tearing Clevo he could conjure. It had to be a Cleveland. As he says, “I’ve been building Clevelands for years. They’re the best for me, and I know what’s best for them.” Although he already had this shell, the Red Rat Reborn had to be an XD too. The word “class” enters George’s conversation a lot. “I really like the XD shape, you can do a lot to them. I used to have XBs, XCs and XYs, but no matter what you do to them they still look old. I like classy cars now. In George’s book, that meant getting nothing but the original and best. He’s been studying the US street machine scene for years, gradually distilling the ingredients for the ultimate Clevo. He put together a list of the bits he wanted and the blokes who built ’em the best. He surmised that he could import all the parts from Stateside, do all the work himself and end up in front. Bang it did, and certainly does. That killer Cleveland reads exactly like what it is – a power maniac’s hi-po wish list, put together over six years in a secret laboratory. When the NASCAR block arrived from the United States it was fully machined, with a four-bolt mains kit, complete head-stud kit and O-ring seals. The steel crankshaft is the fine work of Hank the Crank (who’s another Yank). Onto the Michigan 77 bearings went Carrillo steel conrods and Aries blower pistons with a set of Aries fileback rings. The roller-type cam is by Iskendarian, with 0.650in lift. There’s more Isky-rolling going on in the lifters and the rockers. Up in the open-chamber Cleveland 4V heads, again machined and ported Stateside, are titanium valves with Iskendarian springs. Higher again, above the fully ported BDS blower manifold and the 6/71 BDS blower itself, those two 850 Holley double-pumpers are fed by dual Holley pumps from a Harwood safety fuel cell. Mallory looks after the spark department. Like we said at the start, it’s easy to get distracted by the obvious up-front attributes. 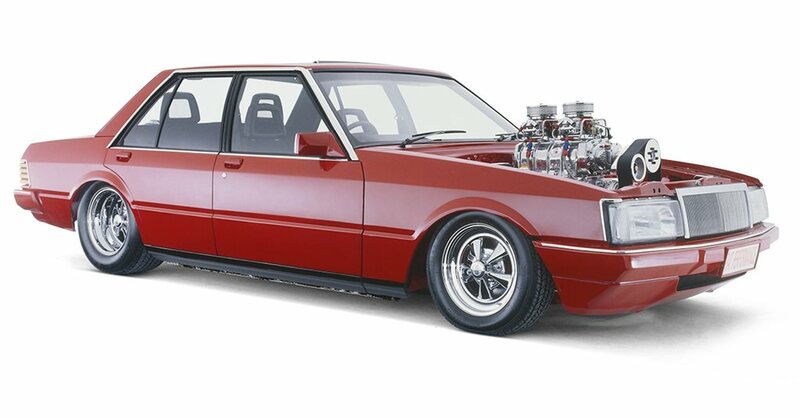 Every other aspect of the Red Rat – from its TCI drivetrain and Paul Rogers-built C6 ’box, right down to its monster tubs and mix of Wilwood racing disc brakes and aluminium calipers – just smacks of the same desire for perfection, uniformity, quality. George says it best: “Class”. Pirelli P-Zero tyres in a 335/35-17 Lamborghini size aren’t your standard street machine fare, for example, but that’s what George was fitting to the rear pair of his brand new Simmons wheels shortly after these photos were shot. And that’s probably the last thing he’ll do to the Red Rat, for there’s a new car on the way. You wouldn’t guess it, so we’ll tell you. A Porsche 911 Carrera, bright red and completely standard. That’s class of a different class. Would you dump your voluptuous girlfriend?